After a good session at Bribie last week, I was keen to get back out there. The wind was light and the moon phase was good, with the tides getting bigger in the run up to the full moon, on Friday. I could not fish the dawn, but I could fish the run out tide for a few hours before low tide, at about 1.00 pm. I arrived just before 9.00 am and decided to keep fishing the flats on the mainland side of the Bribie Bridge. There had been plenty of flathead around and I presumed they would still be there. There was not much wind and the sky was cloudy. I understand it is New South Wales school holidays this week so I expected a bit more boat traffic than normal but as I walked out at about 9.30 am, there were crab pots as far as the eye could see. As I waded south from the bridge, they were everywhere. I counted 50 in sight before I gave up. It made casting a little difficult, in places. There were plenty of sand crabs around, as I kept kicking them. However the density of pots meant that there was a boat arriving to; figure out which were theirs, check them and reset them, every five minutes. This did not do much for the fishing but after all the crap weather we have had, is was good to see boats out and about and the odd pot being pulled up with a few keepers in it. I decided to stay in the shallows and find some undisturbed areas to fish. The tide was running out quite fast and so the boats and pots gradually retreated, leaving me to fish the edge of the sand and weed banks, which were now covered in only 800 mm of water. This is where I concentrated my casts. I tried to pause my retrieve right at the edge of the banks. This was where my first fish of the day hit just before 10.00 am. I was using a GULP Jerkshad in the red and yellow Curried Chicken colour on a 1/8th, 2/0 jighead. It was a good flathead but the sand banks where not yet exposed so I had nowhere to land it. I tried the tricky manoeuvre of pulling the fish into my body then grabbing it with a rag. The fish promptly spiked me hard, unhooked itself and wriggled free. It was a good spike right in the middle of my thumb. I could not rub some slime into it to ease the sting, as the fish had gone and taken all its slime with it! I wrapped it up in a bit of rag. When you get spiked like this the blood does not clot very quickly, as the venom in the spike is slightly anti-coagulant. So if you are not careful, you end up dripping blood everywhere. This is not ideal in waist deep water! The thumb calmed down after a while and I carried on casting. I kept peppering the same spot with casts and I soon hooked up again. This was a slightly smaller fish and made sure it was tired out before pulling it in close and grabbing it with the rag. It ended up being a bit over 45cm. I moved further south and was soon close to the green channel marker. I swapped to a GULP Jerkshad in the Cajun Chicken – the black and purple colour. 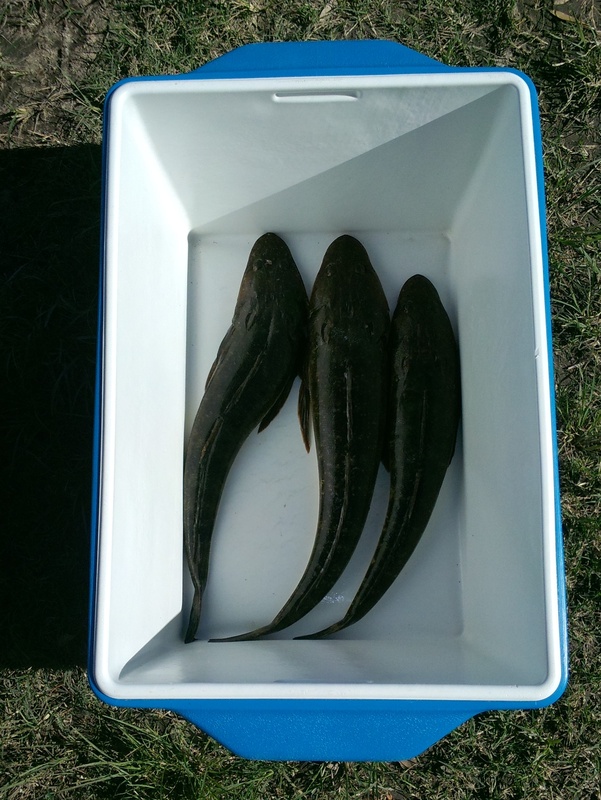 I used the usual technique along the edge of the sand bank and soon caught two more undersized (35cm) flathead. I persisted in the same area and after about ten more casts, I felt a good bite. I paused and dropped the rod tip. When I lifted it I had another fish on. This one was about 45 cm again, and I safely grabbed it and put it in the bag. It was now about 12.45pm and I turned back and waded towards the bridge. In the shallows, just short of the jetty, I hooked another flathead and pulled it up to the shore. It was also a keeper, at about 50cm long. I had to give up at about 1.15 pm, just as the tide stopped moving. I had forgotten the camera today, so only one snap of the keepers is included, from my phone. Considering the late start and all the boat traffic, it had been another good session. This entry was posted in Bribie Island, Fishing Reports and tagged Australia, Bribie Island, catching flathead on soft plastic lures, fishing Gulp soft plastics, fluorocarbon leader, GULP, land based, land based fishing, land-based fishing on the Sunshine Coast, landanglers blog, landanglers Bribie fishing report, landanglers fishing blog, landanglers fishing reports. Bookmark the permalink. I am now desperate for advice on catching flathead with soft plastics. Even after duplicating your jighead weights, hook sizes and choice of soft plastics, I am finding it difficult to catch any- I can only assume that I am using the wrong technique, retrieve rate, wrong tide, conditions, or an accumulation of all of them. What time of day are you fishing and where? I have only just discovered your blog, and am finding it much in tune with the type of fishing that I enjoy , predominantly on Moreton Island or at Wynnum/Manly/Lota. Any particular spots around Wynnum/Manly/Lota ?